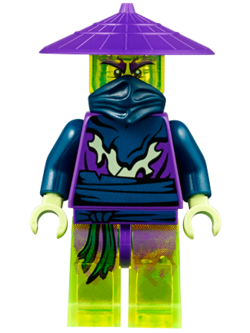 Cyrus is a Ninjago minifigure released in 2015. Cyrus uses the same design as Pyrrhus, Ghurka, and Cowler. This is a description taken from LEGO.com. Please do not modify it. (visit this item's product page) Cyrus is a good fighter and a pretty sneaky ghost, but he doesn't really care if Morro wins or not. He's just doing all this to avoid being bored. If there are no ninja around to fight, Cyrus will pick fights with the other ghosts. Nobody likes him much, but he's too valuable in a battle for Morro to leave him behind. Cyrus is a good fighter and a pretty sneaky ghost, but he doesn't really care if Morro wins or not. He's just doing all this to avoid being bored. If there are no ninja around to fight, Cyrus will pick fights with the other ghosts. Nobody likes him much, but he's too valuable in a battle for Morro to leave him behind. This page was last edited on 20 August 2016, at 21:01.